More proof that I can dance. This was a super fun dance, and thankfully the beat was obvious and easy to follow. Fortunately, you cannot tell that my face was spasming in this picture! 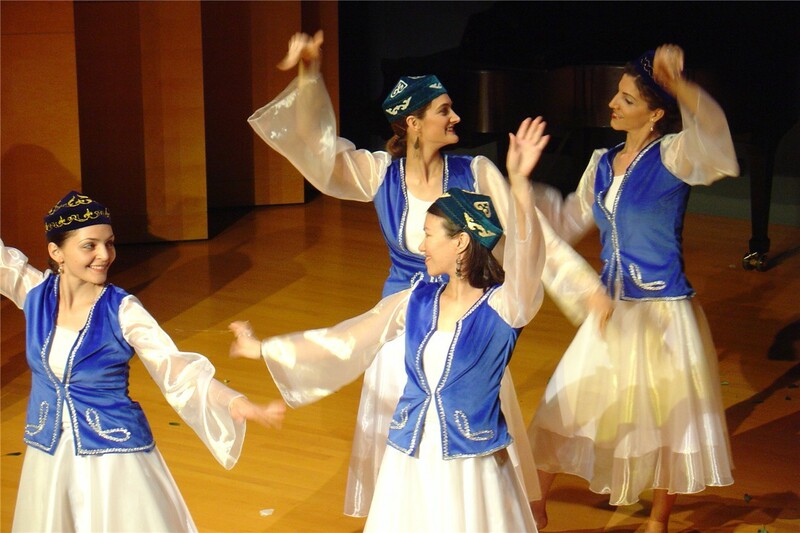 The others in the picture are, opposite me, Canan (Turkey), front left Tamila (Kyrgyzstan) and opposite her, Tahmina (Kazakhstan), who taught us the dance. After this performance somebody asked Mark where I had trained... heeheehee. That was a good feeling compliment. I'll just bask in that for a moment, if you don't mind. I was surprised when purposefulness was drawn as our virtue of the week. I don't think I would have ever named it as a virtue before. Usually one thinks of kindness, generosity, love, obedience, truthfulness...etc., etc. Anyway, purposefulness was a surprise to us. So, as usual, we did a little research and found out a bit more about purposefulness. I also realized that although I can be purposeful, I don't particularly always like to be purposeful. Sure, put a trip to Spain in front of me and I will delight in being purposeful. However, put a 90 page thesis in front of me and my zeal for purposefulness wains. Considerably. But that's not all, it points to a large source of my stress and anxiety, I believe. Ah, how amazingly interconnected everything is. I may eventually get to my ideas of success and failure, too. So sorry if this is boring for you. More for my benefit than yours, I suppose. Feel free to stop here. Maybe you can't tell here, but Andre has the same beautiful smile and cheeks as his Mommy. He's so cute!!! Alright, I want to write about the virtue purposefulness, but for right now I will simply leave you to mull that over, because I just got pictures from my good friend Char, of her beautiful family (with more of it on its way - 3 weeks!!) and I must share them. Not to worry, Char, I won't share the very pregnant picture of you, but I'm so excited for you. My parents will be arriving here for a visit the day you're due! I know I'm the one that is in the Holy Land, but I have a prayer request for you, my readers. Mark's aunt, Auntie Susan, is rather ill. She went into a coma about a week ago, and they have decided that on Wednesday they will take her off life support. I have never met her, but I have spoken with her. She is the epitome of kindness, generosity and sincerity. I think she's had a great influence on who Mark is today, and he reveres her. They say it will be a miracle if she survives once off life support. ... I know this will be a crushing blow to Mark. Please, if you could send happy thoughts, love, support or a prayer her way, I would be very appreciative. Congratulations! You are now reading my 101st entry. Sorry. If you haven't noticed, sometimes I'm not so original. I had a great weekend. It was such a beautiful weekend. The sky was blue, the bay was green (and blue), and the sun was shining. It really was quite enjoyable. At one point I opened all of the windows in our house. I figured it was a great opportunity to let a little breeze run through the house. Delicious. It was also my first sighting of Mt. Hermon "the" snow-capped mountain across the bay. People had told me I could see it on a clear day, but I hadn't. Then I looked up on Saturday and went "OH! That's Mt. Hermon!!" So when I got home from rehearsal, with the sun shining, Mark and I opened all our windows, made ourselves some yummy Kenyan tea from our dear friend Auntieclare and sat down to enjoy the view. DE - VINE! I also performed in the Sounds of the World in a Kazakh dance (waltz/ballet) and it was fun and beautiful and for some awful reason my entire upper lip went into spasms when I went on stage!! AGH! I tell you, it is nigh unto impossible to smile when half of your face is spasming! And no, I don't mean a 'twitch'. I mean a SPASM! It totally freaked me out. I had trouble smiling for the rest of the evening. Is me questioning this exactly what it's saying about me? How can 12 questions (or something like that) really tell me who I am? Why do we do this stuff? Is that last one true? I don't know what I told them to make them think that... whatever. My parents arrive here 29 December. Since it is December, I now permit myself to start an official countdown until when they arrive!